This is a non-gluten free recipe I found somewhere on the internet a few years ago, but have easily made some changes to make it gluten-free! I cannot go without a good pie during the holiday season and end up making this recipe a few times between Thanksgiving and Christmas! I've made this recipe as easy as possible. I guess I kind of cheat (shhh- no one needs to know). 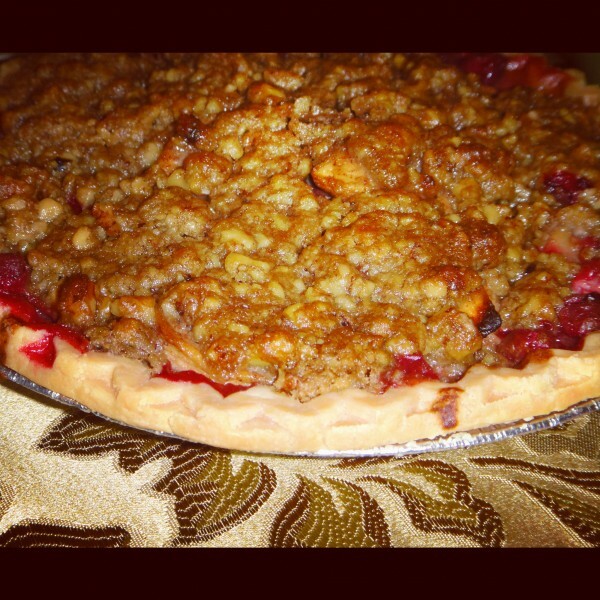 I use a g-free pie crust from an allergy friendly store like Whole Foods. Sometimes the crusts that are available are smaller ones so use as many as you need to use all of the filling, you may just have to make a little extra topping. This truly depends on the size of your crusts and how many mouths you're looking to feed. -Begin by placing Plain Pie Crust in oven for 5 minutes at 325°F- some crusts may have other suggestions for pre-baking, follow those instructions. -Peel, Core, and Cut apples into wedges. -Combine all of the filling ingredients in the apple bowl and mix it moderately well. Let stand for about 10 minutes and everything will become juicier! After 10 minutes, toss it again to coat the apples and cranberries well. -While the pie with filling is baking, prepare the streusel topping. – Set this aside in the fridge until time is up on the oven. -Place pie with streusel added on top back in the oven for 30 minutes or until your pie is perfectly golden brown and looking done. -Once pie is finished let it cool and then ENJOY!!! MMMMM. SUCH AN AMAZING RECIPE, MY MOUTH IS ALREADY WATERING- TIME TO GET BAKING!